Old-fashioned desserts with quirky names always delight me, and this Apple Pandowdy Recipe is one of the best. Lusciously tender apples enveloped in a brown sugar sauce and topped with buttery pastry make a dessert of ultimate comfort and sublime deliciousness. The origins of the pandowdy go back to the early days of America, when Abigail Adams, wife of second president John Adams, dubbed it her favorite dessert. The origins of its name are a bit murkier, but most believe it’s due to the dowdy appearance of the pastry topping. An apple pandowdy recipe is comprised of three main parts: apple slices, sauce, and a flaky but rumpled pastry crust. Cooking apples are the best choice for this recipe since they hold their shape even when cooked in the luscious brown sugar sauce. Granny Smith apples are a popular choice, but I also like Gala or Fuji apples with their crisp flesh and sweet juices that meld beautifully into the sauce and give it even more apple-y goodness. 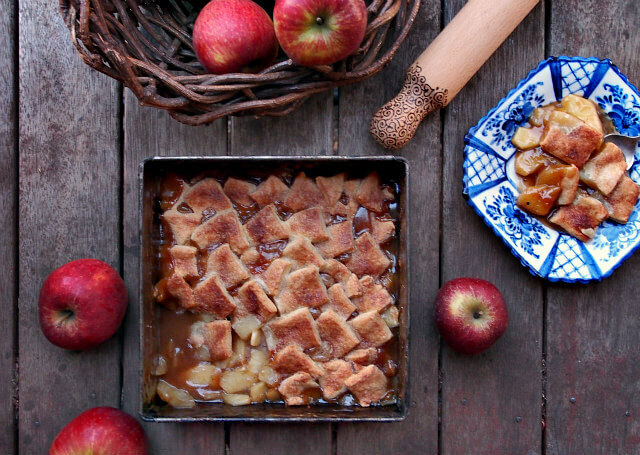 With many apple desserts such as our Apple Cardamom Coffee Cake or Baked Apple Casserole with Chocolate Oat Topping, you can easily leave the apple peels on and still have a good recipe. But with this one, be sure to peel and core the apples so there’s nothing to detract from the smooth mouthfeel of the fruit and the velvety sauce. 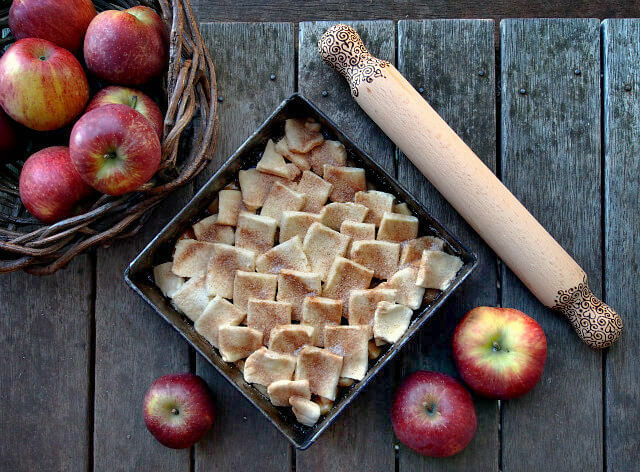 An apple pandowdy recipe is traditionally made with a simple brown sugar sauce flavored with vanilla extract and a hint of zesty lemon juice. I upped the ante on my version with the addition of rum extract, such a scrumptious partner for apples and brown sugar, and a hint of spice through nutmeg and cinnamon. I think this results in a much richer and flavorsome sauce that is divine with tartly sweet apples. Some make their pandowdy by piling apples in the baking dish and then adding the sauce and a dusting of spices. I find it much easier to throw the whole lot into a bowl, mix it well so all the apple pieces are evenly coated, then pour it into the pan. This ensures that no apple pieces are left naked and susceptible to drying out while baking. The essential part of an apple pandowdy recipe is a buttery pastry crust that has been rendered dowdy in some fashion. Some achieve the dowdy crust by roughly cutting into it mid-way through the baking process or after it has baked, while others toss on bits of pastry in an uneven manner then allow the baking process to give it a pleasantly rumpled look. While it may be easier to roll out a single sheet of pastry to top the lovely apples and sauce, I like to take the time to make it a bit more interesting. I cut out little squares of pastry and overlapped them over the filling. With a dusting of cinnamon, nutmeg, and sugar, the crust bakes up beautifully with a lovely hodgepodge pattern that is both dowdy and charming. While you can use any kind of pastry for this recipe, I like using yogurt pastry. 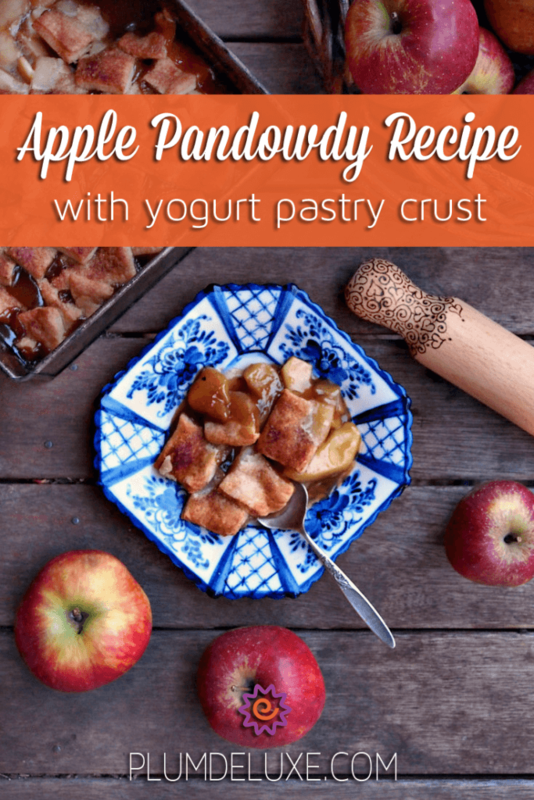 The yogurt gives it a nice tang that pairs wonderfully with the sweet apple filling, and the butter ensures that the pastry is flaky and browns up well during the baking process. This apple pandowdy recipe is delightful on its own, but to really make it a showstopper, serve it with ice cream such as our Easy Sweet Tea Ice Cream or one of our flavored creams with hints of rose petals, cloves and cinnamon, or vanilla bean. It’s even nicer served with a steaming cup of Apple Cinnamon Warmth black tea or Coconut Macaron Dessert Tea. Line a colander with cheesecloth and place over a medium bowl. Pour in yogurt and leave to drain for at least 30 minutes. In the meantime, put butter and flour into a food processor and pulse until the mixture resembles fine breadcrumbs. Add the drained yogurt and continue to pulse until the dough starts to form a ball. Use your hands to shape into a disk about 1 inch thick. Wrap the dough in plastic wrap and chill in refrigerator for 20-30 minutes. In small bowl, stir together cinnamon, cardamom, and white sugar. Set aside. In a saucepan, combine brown sugar, flour and salt. Add water and lemon juice. Place over medium heat and cook until thick, stirring often. Remove from heat and stir in cinnamon, nutmeg, vanilla, rum, and butter. Add apples and stir to coat. 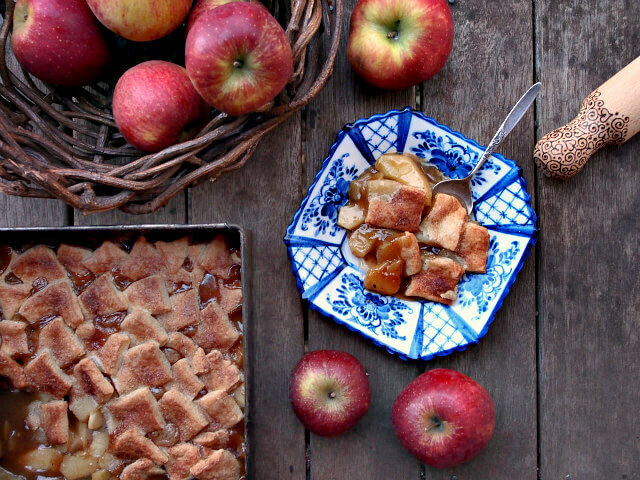 Pour apples evenly into a 9-inch by 9-inch square baking dish. Take pastry out of fridge and roll out to 1/4-inch thickness. Cut into squares. In an overlapping pattern, arrange squares of pastry over the top until covered. Sprinkle with spice and sugar mixture. Bake for 30-35 minutes until apples are tender and pastry is nicely browned.